During the dead heat of the summer, it is common for Tampa homeowners to stay inside and enjoy the cooling comfort provided by their air conditioning system. During the summer months, with temperatures reaching the nineties, homeowners rely on their A/C systems more than any other season. However, it can be difficult to rely on an air conditioner that is experiencing issues. There’s no doubt about it; summer is the most demanding season for your Tampa air conditioner and with all that demand, the chances of unique air conditioner problems occurring are increased. 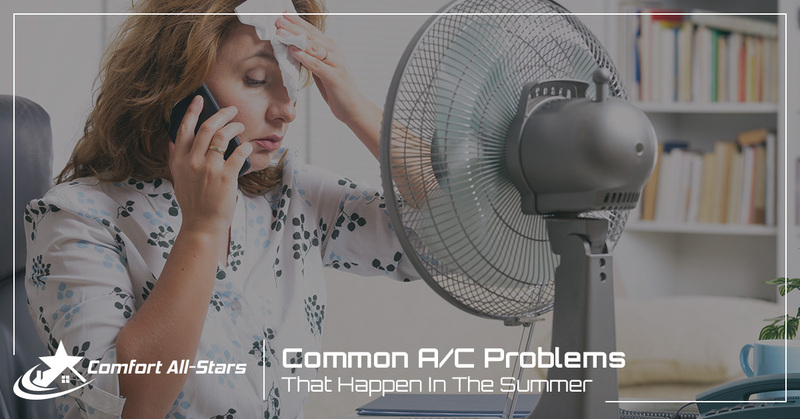 Fortunately, understanding the problems your A/C unit faces in the summer can help you better prepare for what’s ahead, prevent the problems happening, and get the most of your air conditioning system. Before the summer heat arrives, prepare yourself for the following problems that can occur with your air conditioning system during this demanding season. A/C refrigerant leaks are among the most common air conditioning problems that occur during the summer season. When the refrigerant leaks, your air conditioner cannot properly cool down the air in your home, creating an uncomfortable and sticky living environment. When it comes to refrigerant leaks, you need to let a certified HVAC technician handle the problem. Freon leaks can be dangerous and only experienced professionals should be handling it. It is common to see an increase in cooling costs once the summer months arrive. However, getting energy bills that are significantly more expensive could indicate that there is an issue with your air conditioning system. If you think your bill is too high, check with your neighbors and friends and compare cooling costs. There may be something wrong with your system — perhaps something as simple as a clogged filter — causing it to use too much electricity each month. Speaking of clogged air filters, this is another issue that can occur during the summertime. Your air conditioner’s air filter is vital to maintaining good indoor air quality. However, during periods of excessive use, dust, and other particles can quickly build up and cause the filter to become dirty or clogged. An air conditioner with a dirty or clogged air filter will end up working harder to achieve the same level of cooling, putting undue stress on the AC equipment and potentially requiring you to dish out money for necessary air conditioner repairs. Although it’s typically recommended to replace air conditioner filters every three months, you may need to replace the air filter in your AC system more frequently during the summer. During the summer months, you may notice that your air conditioner is not cooling to the temperature you have set on your thermostat, which can be a problem when the outdoors is filled with heat and humidity. Inefficient air conditioning can be caused by multiple factors, and the best way to identify what is causing the problem is to call a technician to take a look at your air conditioning system. Don’t let these common summer air conditioning problems get in the way of keeping you cool and comfortable when the temperatures begin to rise. The best way to prevent and avoid these problems is by having regular air conditioning maintenance from your local HVAC company. A working air conditioner is vital when it comes to beating the Tampa heat, but you could be caught in a sticky situation if you don’t keep it well-maintained! If you need A/C maintenance or A/C repair in Tampa this summer, don’t hesitate to contact the HVAC professionals at Comfort All-Stars! We have the proper knowledge, experience, and equipment to make sure your A/C system is prepared for the demand ahead!